John Ruskin ponders penguins. . .
John Keats borrows a book from the journalist Thomas Alsager. . .
An 1849 court case shapes current discussions about British libel law. . .
Jeannette Winterson restores a Victorian building in the Cotswolds. 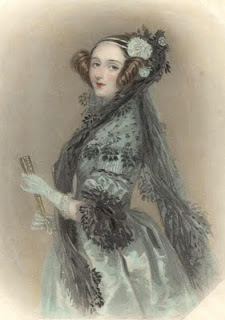 . .
Ada Lovelace, pipe-smoking computer programmer (right), impresses Queen Victoria. . .
Brontë, Nightingale, and Darwin jump to conclusions about that nagging headache. . .
And finally: Afghanistan? Been there, done that. . .